This is one of those geekier posts. Mechanical keyboards. Again. 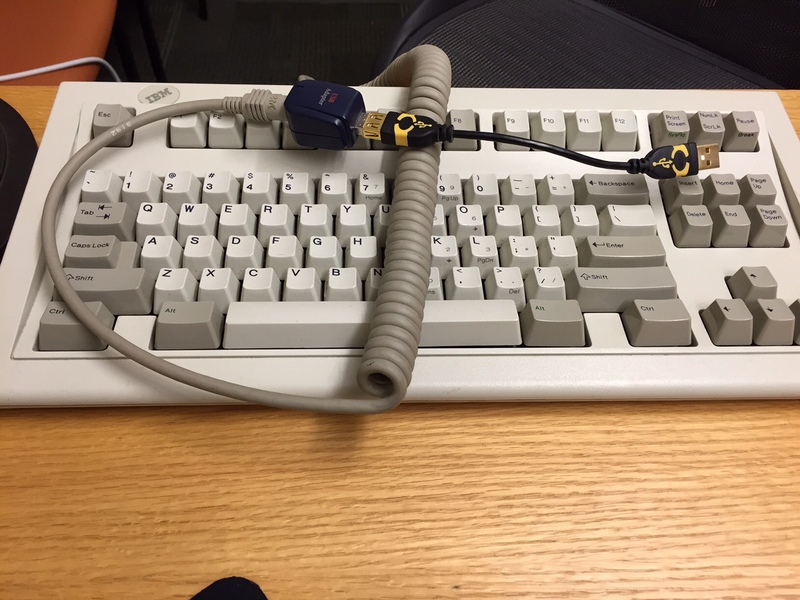 And this time I had the opportunity to test the mother of all clicky keyboards, the IBM Model M, which came into existence in the early 80’s. The thing is build as a tank: not only does it weigh a lot, but it also is virtually indestructible. These keyboards are not made anymore, and that is not a problem, because they have kept working ever since they were built. The unit I was able to test, pictured below, originates from the early 90’s. Believe it or not, this is actually a ‘Space Saver Keyboard’ (SSK), without the number pad on the right, thus considered the smaller unit. Also missing is the ‘Windows’ key. Many things about this board are made with quality in mind, too many to list here. What is more important is how this thing types. My own experience is that I get it why typists love this thing. The experience is magnificent. Each key has a little spring that buckles upon pressing. It gives a distinct *pling* sound and an equally distinct tactile feedback. You know when you type and you feel in control. To me, however, the resistance is simply too great. I found it to be a tiring experience and I am happy to go back to my Cherry MX Blue switches. For those typing for long stretches, for example if you need to write a dissertation, do yourself a favor and consider getting a mechanical keyboard. You won’t regret it. If you like heavier typing, this is just the keyboard you need. How does that work? It’s not a USB keyboard, so how can you connect it to a modern PC? It has a PS/2 connector which is the standard connector for keyboards since the eighties, and normal desktop pcs still comes with this connector. But as you see in the picture, there are converters from PS/2 to USB. That is what I used.